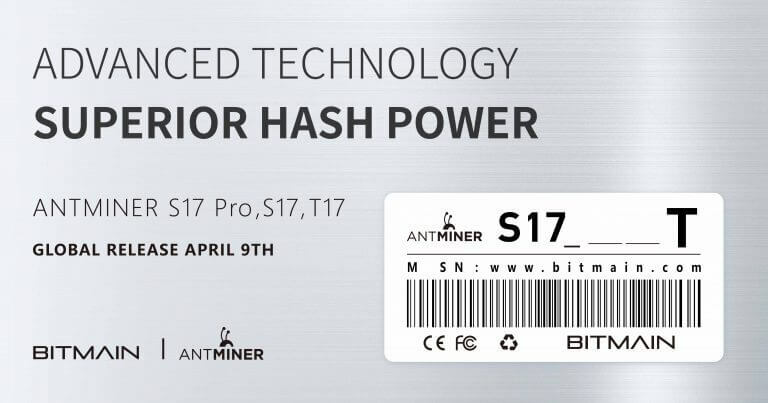 Bitmain announced its next-generation of mining ASICs for Bitcoin, Bitcoin Cash, and other SHA256 coins. The growing difficulty in manufacturing these computer chips raise concerns around network decentralization for these cryptocurrencies. Bitmain is China’s second-largest fabless chipmaker and the world’s largest cryptocurrency mining hardware manufacturer. The company also boasts a huge mining operation, commanding anywhere from 3-15 percent of all Bitcoin mining. Recently, the company announced an improved 7nm computer chip for mining which offers a purported 28.6 percent improvement in energy efficiency, as well as a higher hash rate than previous models. Yangxin, product manager for the 17-series Antminer, stated the indicators to look at when evaluating a new chip is energy efficiency and hash rate. The exact specifications were not released, but CryptoSlate reached out to a crypto-hardware lab and will be receiving the exact performance of the 17-series once they receive test models from Bitmain. Yet, according to Kristy-Leigh Minehan, chief technology officer at Core Scientific, the most important metric from their release is missing—price. According to her, “miners always measure in time-to-break-even.” Additionally, one source close to Bitmain said that the head of sales at the company has not settled on prices for the new models. Unlike other hardware, which is usually priced via cost plus margin, cryptocurrency miners are priced based on how long it takes for those buying the hardware to break-even. Historically, Bitmain aims to provide miners with a break-even point of 6-12 months. “One also has to compare to MicroBT’s products—a M20S, for example, does 72 TH/s total, with 46W per chip. Bitmain will need to have a similar specification or ‘beat’ them entirely to ‘claim’ the throne back from MicroBT,” stated Minehan. Producing competitive ASICs (application-specific integrated circuits) requires a huge amount of research, development, and manufacturing capital. Consequently, there are only a handful of profitable Bitcoin ASIC manufacturers. As a result, only a few companies have direct access to profitable mining hardware for Bitcoin. This is a highly centralizing force when it comes to the distribution of nodes on the Bitcoin network. Bitmain is able to control who and where mining takes place and can continue to expand its share of the network hash rate if it so chooses. Whether this poses a genuine risk to the Bitcoin network is another matter. If Bitmain were to 51 percent attack the network it would undermine the price of bitcoin, likely killing its business and rendering its ASICs near-worthless. That said, 51 percent attacking other smaller coins in the SHA256 family is actually incentivized. Such a scenario was seen during the Bitcoin Cash hash wars. Bitmain, or another large miner, could ransack other SHA256 coin and switch back to mining Bitcoin, posing little risk to the miner. Within the SHA256 algorithm, coins vulnerable to 51 percent attacks include Bitcoin Cash, Bitcoin SV, Litecoin Cash, and Peercoin. Due to this dynamic, holders of cryptocurrencies which are not the largest by hash rate within a given mining algorithm need to be aware of the risks associated with proof-of-work. The post Bitmain Announces Improved 7nm Bitcoin Mining Chips, Price and Network Centralization Analysis appeared first on CryptoSlate.